Wilhelm Richard Wagner was born on May 22, 1813 in Leipzig, Germany. A city famous for its cultural and literary traditions, Leipzig was the home of many of Germany's greatest writers and musicians. Composer Robert Schumann lived in the city for many years and Germany's greatest poet, Goethe, studied at the city's prestigious university. Both Wolfgang Amadeus Mozart and Felix Mendelssohn were organists at the famed St. Thomas Church. Mendelssohn, in particular, worked tirelessly to revive the music of Leipzig's most famous resident: Johann Sebastian Bach. The great baroque composer spent the last twenty-seven years of his life as organist and cantor of the Thomaskirche, composing many of his greatest works while he occupied this post until his death in 1750. It is quite apt that the place where Bach ended his life would be Wagner's start. Young Richard was baptized at the Thomaskirche, and spent his early childhood in this city in Saxony. Wagner's father, at least in name, was Carl Friedrich Wagner, a police actuary who died during a typhoid epidemic on November 23, 1813 while Richard was still in his infancy. In recent years, however, evidence has indicated that Wagner's biological father may have actually been Ludwig Geyer, a talented painter, actor, and poet. Wagner's mother, Johanna Rosine -- the former mistress of Constantin, Prince of Saxe-Weimar-Eisenach -- married Geyer a year after her husband's death. In 1814 the new family moved to Dresden. Geyer died suddenly on November 30, 1821 when Richard was only eight years old, and his untimely death forced the Wagners to move back to Leipzig in 1827. Richard Wagner was interested in the arts from early childhood, and Geyer always encouraged his son to be an active creative force. While a student in Dresden's Kreuzschule, a few years after Geyer's death, Wagner unleashed his artistic demons by writing a lurid five act tragedy, Leubald und Adelaide, under the name Richard Geyer. When the family moved back to Leipzig, Wagner enrolled at the Nicolaischule using the name Richard Wagner for the first time. As a young boy Wagner had always had a deep interest in music but had not had any serious training other than piano lessons at Pastor Wetzel's school in Possendorf, near Dresden. As a result, he had gravitated towards literature. However, as soon as he enrolled at the Nicolaischule, the spirit of Leipzig began working its charm, and he became increasingly absorbed in the musical language of his time. Neglecting his dreams of becoming another Shakespeare or Goethe (the main influences evident in Leubald und Adelaide), he began taking lessons in harmony and counterpoint with Christian Gottlieb Müller, a conductor in Leipzig. At this time, the young Wagner also began to attend musical performances in his native city and elsewhere. His lifelong obsession of composing music was fueled by performances of Carl Maria von Weber's Der Freischütz and Beethoven's Fidelio. Further, he also became fascinated with the path that composer Giacomo Meyerbeer was forging with his titanic romantic operas, and with the melodic bel canto operas of the Italian master Vincenzo Bellini. He would remain a lifelong champion of Bellini (whom he called "the gentle Sicilian") and of his music, especially the opera Norma, which later on Wagner was quick to program when he served as music director of the local opera house in the city of Riga between 1837 and 1839. Between 1829 and 1830, Wagner wrote his first serious music: two piano sonatas and a string quartet, followed by a piano arrangement of Beethoven's Ninth Symphony. Encouraged by his mother, in 1831 he enrolled at Leipzig University in order to study musical composition. In Leipzig, his counterpoint teacher was Christian Theodor Weinlig, the famed theorist, organist and musical director of the Thomaskirche. During this stage of his life, Wagner composed copiously, and quite successfully. Two of his concert overtures (one in B flat major and the other in D major) were performed at Christmas time at the Königliches Sächsisches Hoftheater under the direction of Heinrich Dorn. A piano sonata in B flat major impressed Weinlig so much that he declined further payments for his lessons and arranged to have the composition published by the firm of Breitkopf und Härtel. The work became Wagner's Opus 1. In 1832, Wagner wrote the overture and incidental music to Ernst Raupach's play König Enzio marking the first time that he would write music for the theater. In March of that year Wagner made his debut as a conductor leading his own Symphony in C major. This symphony, clearly modeled on Beethoven, received performances at the Gewandhaus in Leipzig and at the Ständisches Konservatorium in Prague. These performances brought him favorable reviews and a certain amount of fame. It is also at this time that Wagner first attempted to write a work for the lyric stage. He called his opera Die Hochzeit, but never completed it, and instead finished a piano sonata in A major. Between 1833 and 1836 Wagner composed the first two operas of his formative period. The first was Die Feen, completed in 1833, and based on the work of Venetian dramatist Carlo Gozzi, whose texts also inspired Puccini's Turandot and Prokofiev's The Love for Three Oranges. Much of the writing of Die Feen took place in the Bavarian city of Würzburg where Wagner's older brother Karl Albert, a singer, had arranged for him to obtain the post of chorus master at the city's theater. The opera was destined not to be performed until five years after the composer's death. The second work, Das Liebesverbot, based on William Shakespeare's Measure for Measure was completed in 1836 and it flopped after one performance. To fully understand these early works it is imperative that the modern listener be familiar with the literature and music of the Romantic era. These two operas are the products of an imagination overflowing with Goethe, E.T.A. Hoffmann, Weber, Marschner, and Bellini. But it is also an imagination that wants to break free of the Romantic traditions, and to set forth on a new musical and ideological course. He found the way in his increasingly fervent interest and participation in the cause of German nationalism, ideals that would occupy the composer throughout his life. While he was writing Die Feen, Wagner became friends with Heinrich Laube who, along with Heine, was one of the key figures in the "Young Germans," an informal literary society that rejected the Romantic movement of the first decades of the century in favor of a more politically fueled point of departure. The pages of Laube's journal Zeitung für die elegante Welt provided Wagner with his first forum as essayist. In 1834 Wagner published`Die Deutsche Oper,' an essay which began a life-long practice of testing out a particular aesthetic theory in print before attempting to expound on it by writing music. In the pages of Laube's journal he argued that Germans should look to Italy as the model of opera writing. With these ideas in mind, a few months later, Wagner began to write Das Liebesverbot. By 1834 he had completed Die Feen, had set it aside, and had become deeply involved with Das Liebesverbot. By this time he had met an actress named Christine Wilhelmine "Minna" Planer and he had accepted the post of music director of the Heinrich Bethmann's theatrical company based in Magdeburg. Two years later, on March 19, 1836, Wagner conducted the première of Das Liebesverbot at Magdeburg. It was his first opera to be produced. The work proved to be a total fiasco. It left the composer bitterly disappointed and it bankrupted Bethmann's company. With no immediate prospects, Wagner left Magdeburg and followed Minna Planner to Könnigsberg where the young actress had been invited to join that city's theater. 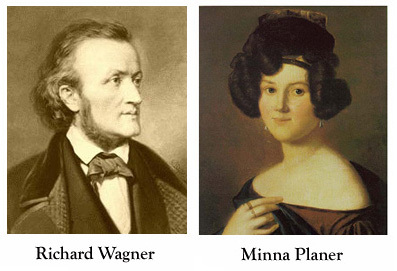 On November 24 of the same year, Wagner and Minna got married. A few months later he accepted the post of music director of that city. Their marriage was stormy right from the start, but they would remain husband and wife for the next twenty years. Monetary problems plagued Wagner for most of his adult life. The theater at Könnigsberg was rapidly going bankrupt, and Wagner decided that it was time to seek employment elsewhere. With the help of Heinrich Dorn, who had conducted the première of his early concert overtures, Wagner obtained the post of music director of the city of Riga. The Wagners arrived in August of 1837, and for two seasons he was able to conduct many of his favorite works, including his beloved Norma. At the same time, Wagner was already writing the libretto for his next project. Becoming increasingly interested in the five act style of French grand opera, Wagner went back to a Meyerbeer-type scale and set out to write the libretto and music to a truly monumental work: Rienzi, der Letzte der Tribunen, based on the novel by the English author Edward Bulwer-Litton. He started writing the music to Rienzi in August of 1838 certain that his post of music director would give him the financial security and peace of mind to be able to finish such an involved opera. However, in 1839 Wagner learned that the theater would not be renewing his contract. With bill collectors and creditors beating down their door (Richard and Minna lived notoriously beyond their means) the Wagners knew that there was only one thing they could do. Under cover of night, with few possessions, and with the unfinished manuscript of Rienzi, Wagner and Minna left Riga and made their way to Paris. Wagner's plan was to finish Rienzi and to use his influential friends to present his new work at the Paris Opéra. But the three years that Wagner and his wife stayed in Paris turned out to be very different than the composer planned.